You may be one of the thousands (perhaps millions?) of BBQ’ers that only know one way to light your grill. You pile charcoal in the center of your grill, douse the works in lighter fluid, and light a match. What would you say if I told you lighter fluid is not only dangerous but could also be imparting a nasty taste in your food? Would you feel better if I said there was a better way to light your charcoal? Well, there’s a few to be honest, but in this article we’ll concentrate on perhaps the best. It’s called a charcoal chimney starter, and in this article, we’re going to discuss how to use a charcoal chimney starter covering what one is, when to use, how and why you should want to. What is a Charcoal Chimney? Why Would You Use a Charcoal Chimney? Are all Charcoal Chimney’s Created Equal? In short, a charcoal chimney starter is a metal cylinder with a grate at the bottom that allows you to quickly and safely light your barbecue without the use of lighter fluid. The charcoal is held close together in the tube, and a fire is started below it with either a commercial fire lighter cube or a few balls of scrunched up sheets of newspaper. As the fire burns upward, the stacked fuel becomes very quickly lit. Note: Click the following link to see a selection of the best chimney starters on the market. In my humble opinion, it is the best, safest, and fastest way to light charcoal. If you want to get your grill on quickly, simply light a full chimney’s worth of charcoal, and you’re ready to sear burgers, steaks, and chops in 15-25 minutes. If I’m going to be grilling at a higher temp (500°F+), I’ll fill a chimney right to the top, light a starter cube, and in about 20 minutes I’ll have a full load of lit charcoal ready to cook with. If I’m going to be cooking low and slow (225°F to 250°F for 4+ hours), I’ll fill up a chimney with unlit charcoal, then dump that charcoal on one side of my barbecue. Next, I’ll load up my chimney about ¼ full with charcoal and light it. In about 15 mins that coal will be gray and ashed over, and I can now pour this on top of my unlit charcoal. This is called the minion method and allows for a longer, slower burn. Using the same amount of charcoal, as measured by my chimney, to suit the method of cooking I choose means I consistently have the same amount of either lit or unlit coals, making my temperature control far easier. Keeping consistent temps is somewhat harder if you have different amounts of lit fuel every time. We’ve all been there. You’ve been cooking up a feast for your family and friends. Burgers, sausages, chicken wings and more have all come off your grill over the last hour, but you still have more food to grill when you notice your temperature is heading south. You’re going to need to add more charcoal if you want to keep this party fed. But, if you simply add unlit briquettes to an already lit fire you run the risk of adding an off-putting taste on the food, caused by the initial burning of binders used to hold the briquettes together. When lit in a chimney these binders burn off quickly. Here’s where having a chimney can especially come in handy. Once you realize you need more charcoal, get out your chimney, throw some more unlit briquettes inside, and light a starter cube. In 20 mins when the coal is gray and covered in ash, add it to your grill, and you’re able to keep cooking without even slowing down. Step 2: Load your charcoal into your chimney. Fill it to the top if cooking hot and fast, or less – about half full – if you’re cooking low and slow. Step 3: Make sure your bottom air vents on your grill are open 100%. If you light your chimney without opening your vent you’re going to be starving your fire of oxygen. Step 4: Place your natural firelighter or 3 balls of scrunched up newspaper under the bottom of the chimney and light it. The firelighter manufacturers always recommend using more than one, but I find one is sufficient 99% of the time. Step 5: In about 15 to 20 minutes you’re going to have lit coal that is ready to cook with. Step 6: While wearing heavy gloves (many prefer to use heat resistant welders gloves), pour the charcoal into your grill. Step 7: Place your cooking grate on your grill, and then place your lid on. In approx. another 5 – 10 minutes your bbq will be pre-heated, and you are ready to cook. Which type of charcoal should you use in your chimney? Either lump-wood charcoal or briquettes? Lump charcoal is simply wood that has been previously burned in a low oxygen environment. Briquettes are a little more complicated. Briquettes are essentially scrap wood that has been ground into particles, and then burned in a low oxygen environment before finally being compressed into a pillow-shape and held together with binders. While briquettes are seemingly more popular than lump charcoal, both have their place in your grilling repertoire. Lump tends to burn hotter and faster, making it ideal for hot and fast grilling. Briquettes, because of their uniform size and shape, are more predictable because they burn evenly. This makes them great for low and slow smoking. After loading your chimney, look to see if many smaller pieces fell through the bottom. These can usually be scooped up and placed back on top. If cooking hot and fast, add more charcoal than you otherwise would if you were using briquettes. I find that since lump burns faster, by the time the coals on top are lit, you’ve completely burned through some of the coal at the bottom. 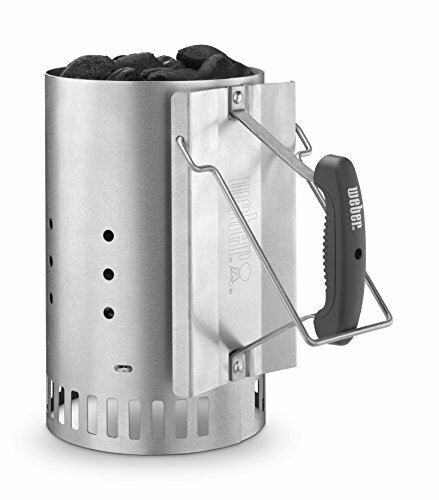 In my mind there is only one charcoal chimney to purchase: the original Weber 7416 Rapidfire® Chimney Starter. There are many others out there, but they cannot hold a candle to this product. The Weber rapidfire chimney can hold a lot of charcoal, has a heat deflector built into the handle, and has a second handle that makes it easier and safer to dump the hot coals into your cooker. When lighting, avoid the temptation to use lighter fluid. You don’t need it, and you don’t want the taste that comes with using it. Make sure you’re using heavy gloves when dumping out your charcoal because it’s going to be very hot. Just as important (and I learned this the hard way), you’re going to want to make sure you have closed toe shoes on, not sandals or flip flops as occasionally, a small hot coal will fall through the bottom after lighting. You can use your chimney for more than just lighting charcoal. A very popular way to use one is to give your steak a killer sear, sometimes called the afterburner method. The venerable Jess Pryles recently made a video outlining her method for searing steaks with the afterburner method. Essentially, if you are cooking thick steaks, you’re going to want to employ the reverse sear, this is when you slowly bring the internal temp of your steak up to around 120 – 125° internal. Once you’re at this temp, remove your steaks to rest. While the steaks are resting, fill your chimney half-way with charcoal and get a fire going. Once the coals are ashed over and you have flames coming out the top, put a cooking grate on top of your chimney to cook your steaks on for approx. 30 seconds to one minute per side. Since the heat source/flame is so close to your steaks you’re able to take full advantage of the maillard reaction, and give your steaks a beautiful crust on the outside, while the inside is a perfect medium rare. Just keep an eye on your steaks, as they can burn easily over the intense heat. Hey, it’s not called the afterburner method for nothing! How do you light your fire? Do you use lighter fluid, or have you been using a charcoal chimney for years now? If the former, does this article make you want to put down the fluid and pick up a chimney? It really is one of our favorite grilling tools, making lighting a grill so easy, quick and consistent time after time. What is BBQ Bark? Why Do We Want it? How Can We Get it?